Cash Register Services can provide you the latest high quality scales offering your business the best technology and functionality for the right price. Price includes 12 Months Warranty. 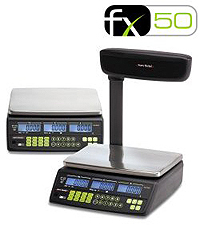 Designed to offer all the functions your business needs, the FX50 is a simple price-computing scale with great features like large, easy-to-use keys on a wipe-clean keypad and highly visible back-lit vendor and customer displays. It's as easy to programme as it is to use and offers up to 50 Price Look-Up keys, 12 of which are hot-shot keys for fast-moving items. Click here to go to the Avery Berkel website for technical details about this machine, or click the .pdf logo for the brochure.